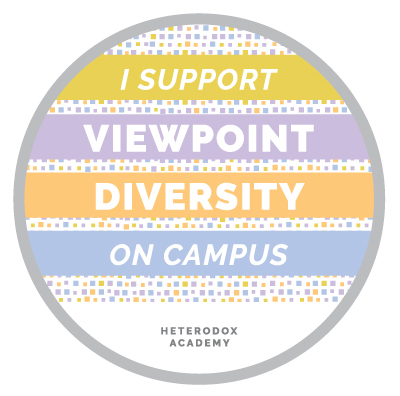 Heterodox Academy, the self-proclaimed champion of viewpoint diversity, suppressed my viewpoint. Heterodox Academy’s Chris Martin no-platformed me, apparently for ideological reasons, thus violating Heterodox Academy’s reason to exist. I tried to express an alternate viewpoint in the comments section of a blog post and video at the web site of Heterodox Academy (HxA). I divided my argument into eight parts, or logical steps, and posted each separately. I did this because HxA placed a character limit on its comments and I needed the space to adequately develop and defend my idea. I wrote all eight steps in Microsoft Word before I posted them to HxA’s comments section so I was able to copy all them below. Chris Martin replied in the comments that, given my viewpoint, “Heterodox Academy is not for you.” He deleted five of the eight parts of my argument, citing HxA’s character limit as the reason. Martin mentions only that he deleted parts 4-7, presumably because he did so before I posted part 8. Note that many of HxA’s own blog posts far exceed the character limit it places on respondents. To increase viewpoint diversity in the academy. By a) denying me the virtual ink and paper of space in its comments section, and by b) doing so for apparently ideological reasons, the self-proclaimed champion of viewpoint diversity exemplifies that which it purportedly was formed to fight. April Kelly-Woessner moves the ball farther down field than most analysts when she identifies the failure of K-12 education to provide our children with civic knowledge and historical perspective as key contributing factors to today’s problems. She echoes a sentiment I expressed two years ago when I argued that The Yale Problem Begins in Kindergarten. But by failing to identify WHY the education system fails to achieve what is arguably its reason to exist – its Telos – she fails to make it into the end zone. She fails because she’s talking about the SYMPTOMS of the disease that’s infected Western culture. She’s NOT talking about the VIRUS that is the root cause of the disease. The same is true for analyses that identify ideological struggles as between “progress” and stability, or social justice and social order, or post-modernism and modernism, or globalism and nationalism/populism, or egalitarianism and authoritarianism. Every one of those phenomena is a SYMPTOM. None is the VIRUS – the root cause – of Western Culture’s current troubles. The root cause for BOTH a) the failure of K-12 education AND b) the failure of academic social science to see it, are one and the same. The education system and Western culture as a whole, is still blindingly entrenched in the “two-hundred-year tangent” that Haidt calls The Rationalist Delusion. The root cause of the “Coming Apart” AND of the failure of academia to see it, is, in a word, WEIRDness. It is the cognitive style of the leftist righteous mind which, not coincidentally, enjoys near total hegemony over K-12 education INCLUDING academic social science, and almost the same level of control over all forms of entertainment and media as well. We worship WEIRDness and we vilify holistic thinking as superstition, faith, or dogma. We revere pendantry, and we eschew sagacity. The good news is there are signs of a movement afoot that seeks to inoculate us from the virus of intellectual and moral myopia of left wing WEIRDness that has infected our society. It seems that more and more social scientists are realizing, as Rebecca Sear observed in her plenary at #HBES2017, that Interdisciplinary research is the future of social science. The paper Evaluating Evidence of Psychological Adaptation by David P. Schmitt and June J. Pilcher describes the process in detail. The research methods described in these sources collect evidence across multiple disciplines like evolutionary behavioral sciences, genetics, evolutionary biology, epidemiology, anthropology, psychology, history, sociology, economics, and demography, to name a few. What this process does, in simple terms, is methodize, or operationalize, the dot-connecting that is characteristic of the holistic cognitive style of the conservative cognitive style into a set of steps and approaches that the WEIRD analytical methodical academic brain can follow. This is EXACTLY the kind of scholarship which, according to the scientist quoted in my first comment, is missing from academic social science. The fact that it is missing explains why so much modern analysis misses the virus that’s hiding in plain sight behind all the symptoms analysts toss about. Cognitive style is a moral foundation in the sense that it is part of the evolved psychological “low hanging fruit” that determines ideology. Just as there are different physical body types (e.g., ectomorph, endomorph, and mesomorph) so too are there different brain types. It is counterintuitive – silly, really – amidst all the variation we see among humans, to think that we all have the same cognitive wiring. In his book The Cave and the Light Arthur Herman traces the two main cognitive styles through 2500 years of human history. That these patterns of thought have appeared over and over across such a broad period of time in so many different eras and situations is strong evidence that they are moral foundations. The mistake most modern thinkers make, Herman , Sowell , and April Kelly-Woessner included, is that they perceive and describe these two phenomena in terms of the people who first articulated them (Herman), or in terms of the interpretations – the symptoms – that follow from them (Sowell and April Kelly-Woessner). None of those thinkers in their analyses took the next logical step backward to root causes. All seem content to describe the WHAT, but none seems curious to ask WHY. The two philosophers James saw as epitomizing the tender-minded versus tough-minded split were probably Hegel and John Stuart Mill. 28 Still, with the exception of optimism and pessimism (and here James was thinking of the optimism of Hegelians and Marxists in believing history has a final purpose), it’s clear he was really talking about the perennial split between Platonists and Aristotelians in a distinctly American guise. Interdisciplinary research from sources like The Righteous Mind, A Conflict of Visions, The Cave and the Light, The Great Debate, The Ideological Origins of the American Revolution, and similar histories of political upheavals elsewhere a picture, practically a definition, of the two major brain types emerges. Conservatism is the psychological profile of the all-foundation moral matrix in combination with the cognitive style of holistic intuitionist Aristotelian empiricism. . It is the predisposition (ala Hibbing) toward the set of moral intuitions for which the object of care is the family unit – social capital – and which favor process-based negative conceptions of liberty, equality, justice, and fairness. Its goal is “to create a healthy, happy society” that does the most possible good for the most possible people. It accepts human nature as immutable, and sees the enemy of liberty as consolidated, concentrated, political power. It therefore sees government as a necessary evil, the purpose of which is to protect rights, and for which power must be restricted lest tyranny and oppression rule. Liberalism is the psychological profile of the three-foundation moral matrix, with extra emphasis on care, in combination with the cognitive style of WEIRD rationalist Platonic idealism. It is the predisposition (ala Hibbing) toward the set of moral intuitions for which the object of care is the individual and his/her feelings, and which favor outcome-based positive conceptions of liberty, equality, justice, and fairness. Its goal is “to create a healthy, happy society” that does the most possible good for the most possible people. It sees human nature as having unlimited potential, and sees political power as a source of good. It therefore sees government as the ultimate tool for achieving good, for which power must be consolidated and concentrated in order to prevent the rich and greedy from abusing and oppressing the less fortunate. The two psychological profiles, or operating systems, or brain types, or cognitive styles, of WEIRD Platonic rationalist idealism and Holistic Aristotelian intuitionist empiricism are the true definition of the political spectrum. In The Cave and the Light: Plato Versus Aristotle, and the Struggle for the Soul of Western Civilization by Arthur Herman, Plato and Aristotle are metaphors, or proxies, for these two basic types of brains. Everybody, equally, regardless of ideology fervently wants progress and improvement. The struggle between left and right is NOT a two dimensional either/or tug of war between “progress” and “stability,” or some such notion, as it is ubiquitously yet in my view erroneously depicted. The struggle, rightly understood, is between two moral cognitive operating systems that process the same basic inputs but reach starkly different conclusions about human nature and based on that HOW TO GO ABOUT ACHIEVING progress and improvement. The depiction of left vs right as a two-dimensional tug of war between progress and stability or globalism and nationalism/populism or egalitarianism and authoritarianism is itself an “entrenched yet questionable orthodoxy” that prevents insight and understanding, and therefore effective solutions. Remember, there’s no liberal moral foundation that is not also a conservative moral foundation, but half of the conservative moral foundations are external to the liberal moral matrix. Likewise, the cognitive style of Platonic Idealism relies almost completely on ONLY Oakeshott’s “technical” knowledge or abstract reason, whereas Aristotelian empiricism relies on BOTH technical AND practical knowledge, on the emergent synergy of reason AND experience. The correct depiction of the political divide is more like a struggle between a two-dimensional moral cognitive space and a three dimensional moral cognitive space, as in this Venn Diagram. The real political divide is between Flatland and Spaceland; between liberal Platonic idealistic Flatland and conservative Aristotelian empiricist Spaceland. Thus the profound problem we face. Liberalism is blind in one eye”yet it insists on the superiority of its vision and its supreme right to rule. It cannot see half the things a governing philosophy must see, and claims that those who see both halves are thereby unqualified to govern. The 2D tug of war scheme is dogma, it’s a sacred value, a Procrustean bed, that all analysts seems to want to force the data into. I think the problem is form, not content, not your viewpoint, but the length of your verbiage. You evaded the character limit by dividing into multiple comments, but that really is violating the terms of service. That blog posters can write long is their privilege. Commenters don’t get the same privilege and that’s appropriate. I’ve read and watched Chris Martin and I think he’s sensible. It’s their blog, and they can set the rules, just as you can here. With all due respect Whig, I suggest a bit of self reflection is in order.